Great Buy. Exactly what I needed. Great price. Needed extra pantry room. The size, color and style of this cabinet is just right. The top of my refrigerator is now clean and clear. Assembly was a snap. Parts were numbered. Took about 2 hours including plenty of breaks. The hinge holes were a little off but easy to line up the doors perfectly once the cabinet was standing by putting a cardboard shim under the two doors to make sure they were the same height. Screwing in the twenty some screws for the back panel took the longest even though it took no skill (Hint: the silver screws are for the back panel and the black screws are for the hinges only. will save you double work). Overall, one of the easiest pieces I have ever assembled. I ordered and received the product listed. As another posted, it was much lighter in color than expected (absolutely not as shown). The assembly was not easy to assemble (though not impossible with a little determination). Just so that you know (in term of the asembly) some of the "pre-drilled " holes did not exist and I had to create them. In terms of the quality of the wood, it wasn't bad. At least it was real wood and not this fake/composite/pressed wood that most things are made of these days. I have a country home and I had been looking for years for a perfect cabinet to place against a small wall between the living room and the kitchen. This cabinet is PERFECT. It wasn't too hard to put together, and it holds quite a bit of stuff. This was a great addition to my home decor. After reading the reviews on this Tall Cabinet, I was pleased to note the package arrived in excellent condition and the contents were wrapped to assure no damage could occur during shipment. Unwrapping the carton, we noted each component was marked with a number or letter that corresponded with the enclosed list and directions for assembly. We counted all the parts, were assured that each one was present and accounted for and then began the construction of our new cabinet. To avoid any possible distress to the wood, we assembled the cabinet on a blanket covered kitchen floor. From the point where we had everything laid out in prep through the assembly process took approximately two hours. Some of that time is attributed to the one fact that many reviewers mentioned, the back panel (cardboard backing) did not have associated holes drilled to accommodate the included screws. Once we set up the completed cabinet in the spot where it was to reside, we could not have been happier. The cabinet doors aligned nicely once we adjusted the magnetic closures and the entire unit was plumb and sturdier than imagined. We are using the cabinet as an additional kitchen pantry and the adjustable shelves did make a difference. I was able to set it up to allow for large boxes of cereal and bottles of vinegar and oil to fit without an issue. The cabinet size is deceptive, it holds way more than I thought it would. I was able to empty two large base kitchen cabinets and a table full of canned tomatoes (58 jars) into the cabinet and still have room for more groceries. We are happy with the style, size, color and configuration of this item and might consider coming back for another to use in the hallway or entry. This is such a nice pantry! I bought it in red. As I have limited storage space, I needed something well constructed, something that made my home look more like my style while helping store foods that needed a home. I LOVE IT! I don't think anyone would be disappointed with this pantry. I immediately chose the red color and am guessing there are more options. You'll be as pleased as I am when this sweet piece finds its way to your home. A great purchase! This gives the home that country old look!! Built solid and easy to put together. I live in a small apartment, but I needed storage space for my herbal supplies. This cabinet fit the bill exactly. It's just the right size to fit my supplies. Also, the color is much better than what I had anticipated. It looked a little light on the picture, which I was willing to live with, but the actual color is closer to what you would expect from something labeled as "weathered sage." It's lighter than a hunter green but not light enough to be a pastel. It took me about 2 hours to put together by myself. It probably would have taken about 20 minutes less if I had had a power drill to attach the back panel. Overall, I'm quite pleased with my purchase. I find one of the key things to getting satisfaction from Overstock purchases is to make sure the dimensions of the piece fit what you need. The pictures can be deceiving. This piece is perfect for my room, but it could easily get swallowed up in a much larger room. This is perfect for storing the overflow of canned goods that got buried in my pantry so it's easier to see what I have before I make the mistake of buying more of what I already have. It is easy to put together. Check your height needs before you purchase. It is 48"....perfect for what I needed but I would not label it as "tall". The very slight tint of green in the antique white cabinet is only noticeable if you put it next to another "antique white" piece. I don't think you can ever perfectly match a color anyway and I had the flexibility to place somewhere else in the room that I wanted, just not right next to another piece. I am pleased with purchase and do recommend it. I like this cabinet. It was one of the simplest to put together out of other unassembled furniture. I use it to store dry goods in my kitchen. The two inner shelves are adjustable. The bottom cabinet is tall enough for a box of cereal. This is such a well made and versatile piece of furniture, perfect for use in our kitchen. It is easy to assemble, looks great and is affordable! 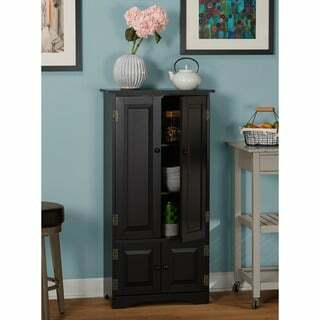 This Simple Living Tall Cabinet isn't very tall but it is perfect for what we needed. It looks great & holds all items I need it to hold. The directions were not very good as they were drawings only, need some actual written directions or better yet a video. Took awhile to complete but it looks great, quality for the price. Packaging was great with no damaged pieces. Very happy with our purchase. This Tall Cabinet adds room for many kitchen items. My kitchen is small so the fact that this cabinet is tall and narrow works quite well. The wood is solid and I like the color white which brightens up the kitchen. I will say it wasn't easy to put together but all the pieces were there including the directions. It was delivered promptly and in good shape. This cabinet is being used as an additional pantry and it is perfect for my needs. It is attractive and small enough to fit in the space that I had planned to use it. It required assembly, but that was also very easy. This cabinet is very nice and a very pretty red.... Mine was not lighter in color then shown in picture. It is sturdy if put together properly (back board is in two pieces, it has a connector that has to be placed right in center to hold it together) if you don't connect those two boards in back, the doors won't shut properly. Was it hard to put together...? Not really, you just have to make sure you don't put the doors on backwards or upside down ... The finished product, I love it..! Adds a color to my kitchen... Plus, several large boxes of cereal will sit on top shelf... probably second shelf also... Very bottom part of the cabinet, is great for items you don't use often.... (because you have to stoop down...haha) It's not real wood, but then for this price you wouldn't get real wood... It's very nice looking, its sturdy and it serves it's purpose. I love Overstock.com and this is only the second time I have not been satisfied with the quality. This cabinet is described as a tall cabinet. This cabinet is not tall, nor is it deep. I bought three to use as linen cabinets in my bathrooms, but it is not deep enough for towels. It would be deep enough to use as a kitchen pantry, but this cabinet does not hold much. i am returning two cabinets unopened because it isn't even worth the time it takes to put together. I do not recommend this cabinet especially for the price. I wasn't expecting too much quality-wise from this product as it was clearly not wood and an inexpensive alternative to more expensive, higher quality items. All I needed was a small pantry to supplement my lack of storage and that's what this provides. The finish on it is nice and it actually looks pretty good. The hardware compliments the finish well. It was pretty easy for me (64 yr old female) to put together by myself. All the parts were there. The only issue is the 2 top doors aren't exactly flush. The one on the right must have had the hinge pilot holes drilled slightly off as it's about 1/8" below the top and has a tendency to slightly bind when closing; however, it looks okay and the binding isn't that bad. I think a couple other reviews stated the same thing that the doors don't always line up. Overall, if you're looking for something that's not in the $350-$450 range just to use for some additional storage, you'll probably be happy with this product. It can also be painted with chalk paint (I do a lot of that type of thing and know that chalk paint will stick to this product's surface). Bought the Extra Tall Cabinet in Honey Pine. Love the weathered finish and hinges! Lots of shelf space for its size - perfect pantry for our small kitchen. Will probably buy another for linens, etc. Assembly needs 2 people for some steps. Very happy with this handsome cabinet! This was a perfect addition for our kitchen. We needed the extra storage and we didn't want it to be too big which makes this pantry perfect.